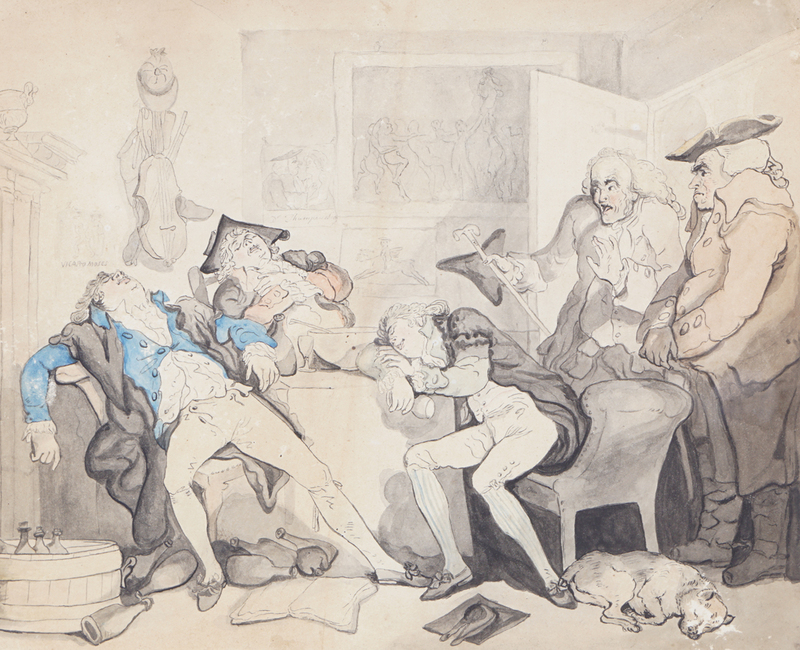 There’s a veritable flood tide of original works by Thomas Rowlandson coming up for auction in the UK at the moment. 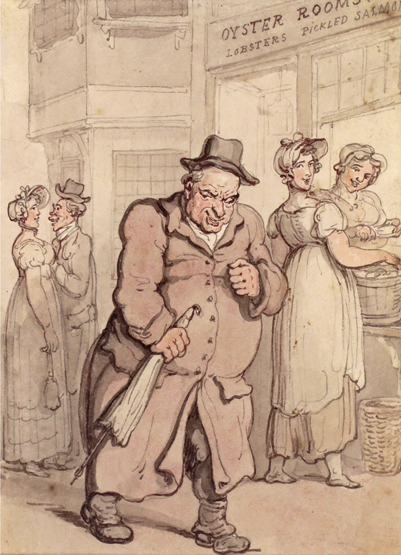 These include genre scenes, character studies and a few humorous pictures. 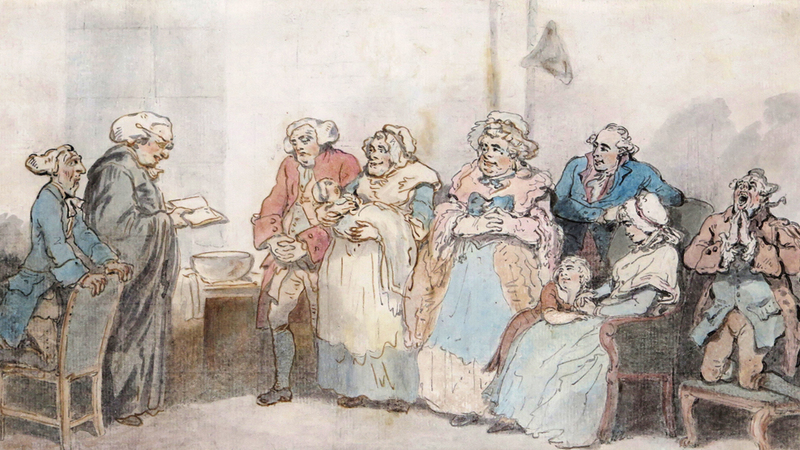 Perhaps the most interesting is The Wigsteads: A Christening which depicts Rowlandson’s friend and fellow caricaturist Henry Wigstead (1745 – 1800) and his family. 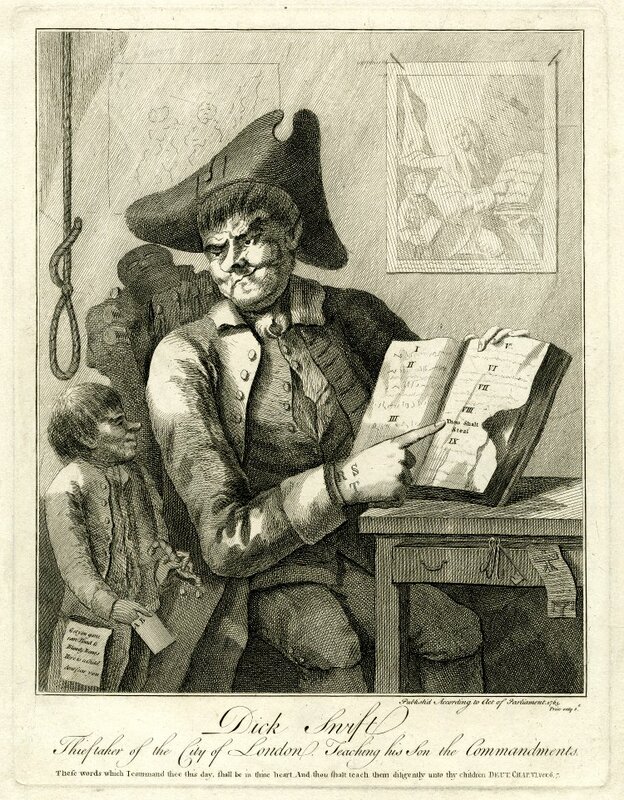 Although I also have a soft spot for the untitled caricature of a group of drunken students being sternly regarded by their tutors. It appears as though some things never change. I should point out, before anyone gets all excited and starts emailing me to enquire whether I’d be willing to sell this drawing or that drawing, that none of these pictures belong to me and I’m not offering them for sale. The images are taken from various sale catalogues and are being shared here in order to record original works which would otherwise disappear into anonymous private collections once the auctions have taken place. 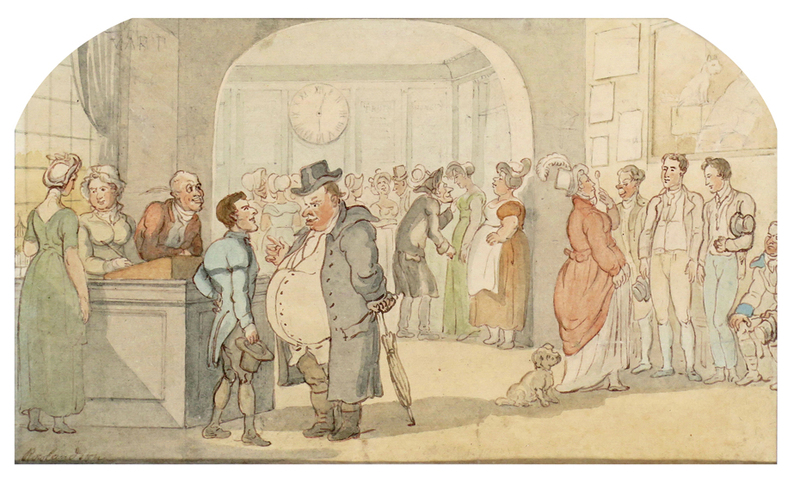 Shortly before midnight on 4th June 1806, a heavily inebriated man stumbled through the door of the Key Hotel in Chandos Street and ordered a meal. He was a cheerful character in his late 30s, and he dressed in a refined if somewhat sombre fashion which led many casual observers to assume that he was a priest of some kind. Unfortunately, his dress was the only sober thing about him that evening, as member of staff at the Key would later attest that he had visited the establishment several times in the last few weeks and was always the worse for drink. The guest washed his meal down with a bottle of wine and ordered a further two bottles to be taken up to his room. 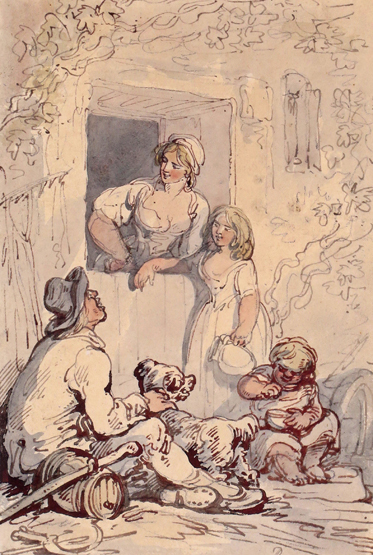 The historical sources are silent on the quality of the repast but it probably mattered little to our friend, as food, drink, and accommodation, were all incidental to the main service that The Key provided to its guests; it was one of the most notorious bagnios in all of early nineteenth-century London and allowed resident and strolling prostitutes alike to ply their trade openly within its walls. At around 2.30am the guest retired to bed with a young lady. 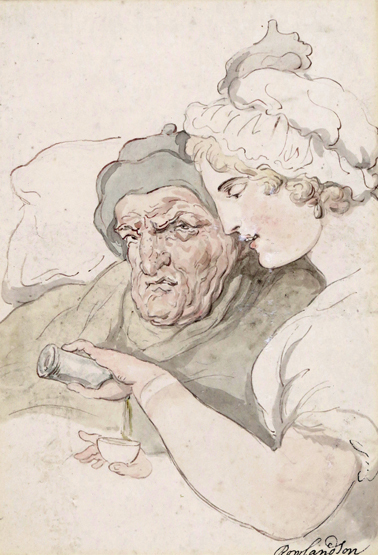 A chambermaid was dispatched to their room a few minutes later in order to help the prostitute undress, but she reported that the man had passed out in stupor on the bedroom floor and that his companion had gone to bed without him. Fearing that he might wake up in the night and not know where he was, she lit a candle and left it on the floor next to the man before returning downstairs. Fifteen minutes later, the hotel was filled with sound of a woman screaming. A waiter, who ran up from the dining hall, found the prostitute standing on the landing in her night gown in hysterics, thick smoke and the flicker of flames emanating from the open bedroom doorway next to her. The room was already engulfed in flames and the waiter immediately concluded that any attempt to rescue the drunken guest would be folly. Instead, he calmed the young lady and they then ran from door to door, rousing the other guests and alerting them to the danger. Chaos ensued as half-dressed working girls and their unsuspecting punters scrambled to save themselves. Many panicked, being unaware that the fire had yet to properly take hold of the building, and clambered from first floor windows, dropping into the street below. Their desperation was such that one old man, whose clothing had become entangled as he tried to escape, was left dangling above the street in ignominy; until someone was eventually able to haul him back into the hotel and help him flee via another route. 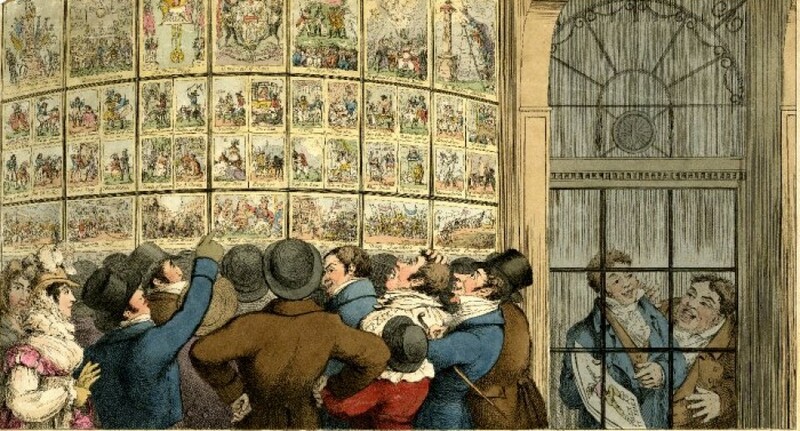 Crowds assembled in Hanoverian London at the drop of a hat and the spectacle of the Key’s destruction provoked a large assembly of slack-jawed gawkers, who mingled indiscriminately with hard-pressed parish fire-fighters and stunned prostitutes, as the building collapsed in front of them. 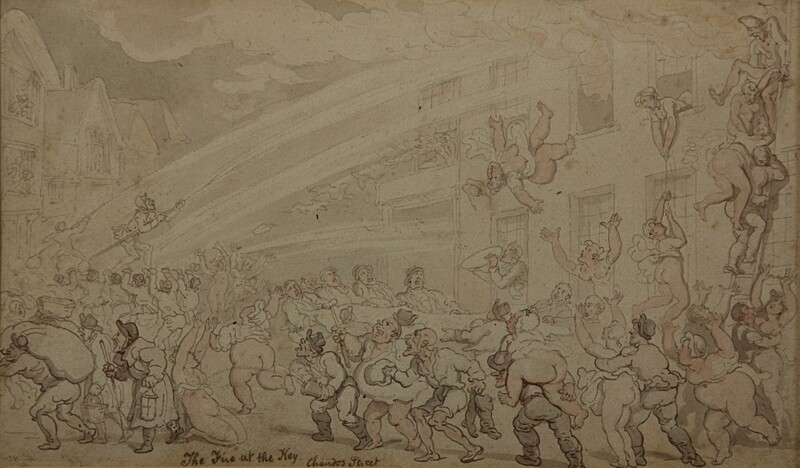 It seems likely that Thomas Rowlandson was amongst the crowd, as his apartment in the Adelphi Buildings was just a few minutes walk from Chandos Street and would surely have been within earshot of the commotion. 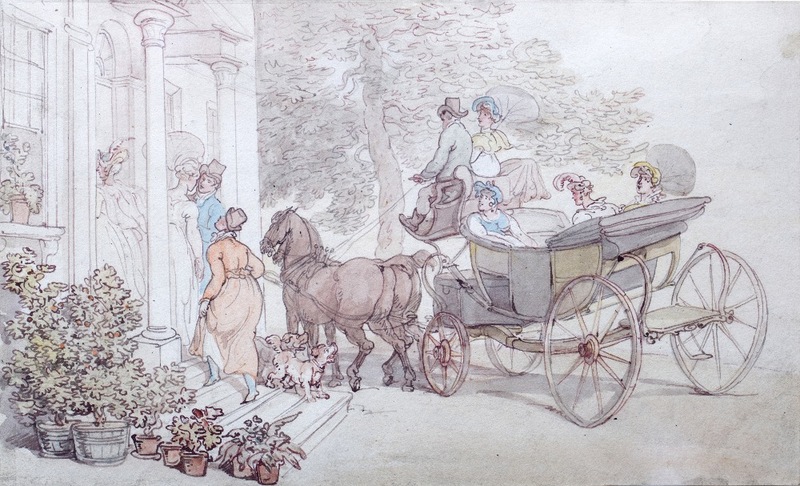 He later produced this watercolour of the scene, which is it seems safe to assume was heavily embellished with some of his stock comic characters in order to add humour and vitality to the proceedings. 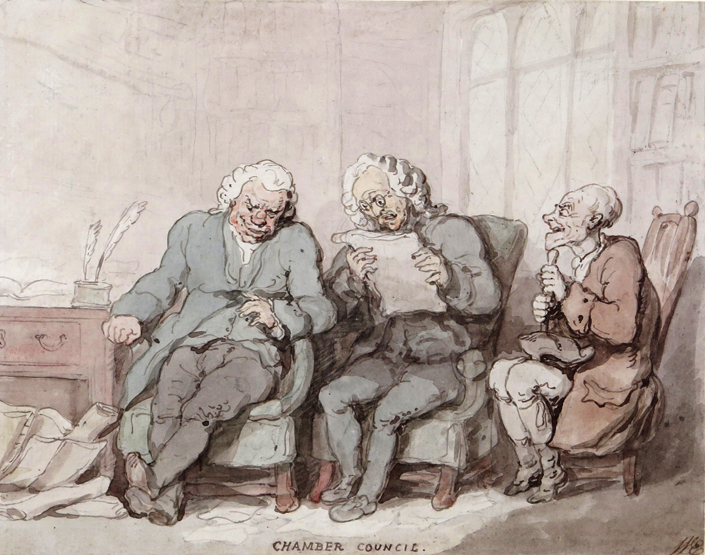 Thomas Rowlandson, pen, ink and wash, 14.5 x 24cm. 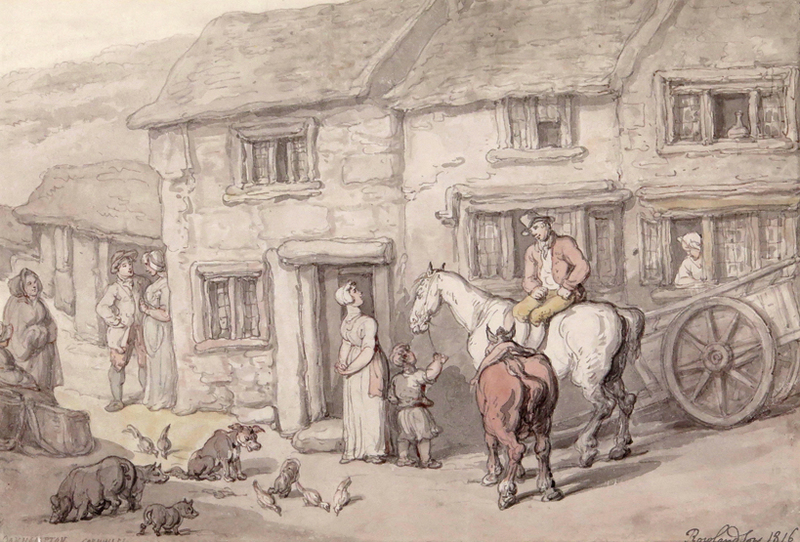 Signed and titled ‘The Fire at The Key, Chandos Street’. The European Magazine, and London Review, Volume 49 pp. 480 – 1. 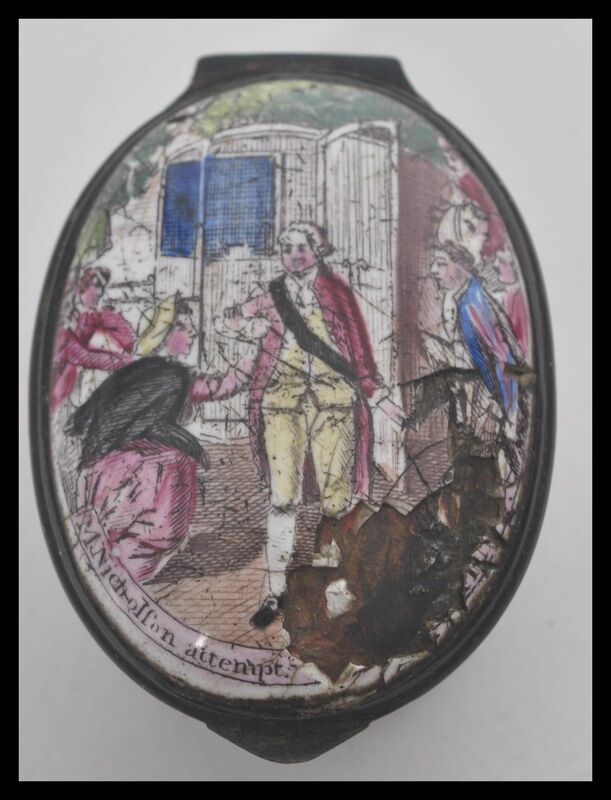 On 2nd August 1786, George III was alighting from his carriage outside St James’s Palace when a poor woman dashed towards him holding out a piece of paper. As he reached out to take the paper, which he assumed to be a petition of some kind, the woman lunged at him with a large table-knife she had concealed in her other hand. The knife had sharp edges but a blunt point and it failed to penetrate the king’s topcoat. She was quickly seized but the king shouted out: “the poor creature is mad, do not hurt her. She has not harmed me.” Upon which, the would-be regicide was led away quietly. The lady’s name was Margret Nicholson, a former maidservant who had fallen on hard times and apparently drifted into insanity, eventually believing that she was the rightful queen of England and George and a usurping impostor. She was immediately certified insane and committed to the ‘incurables’ ward of Bethlem Royal Hospital, colloquially known as ‘Bedlam’, where she would remain for the rest of her life. The incident proved to be something of a propaganda coup for the royal family and spawned a wave commemorative prints and other commercial tat with which loyal subjects could demonstrate their thanks for the king’s deliverance. This enamel box was probably manufactured in the West Midland’s town of Bilston, which was then the centre of the English enamel trade. 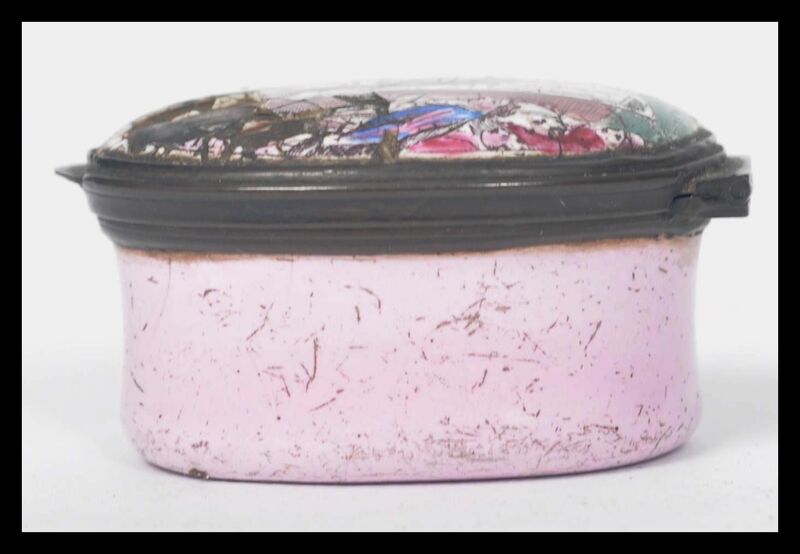 It measures 2.5 cm, 3.5 cm wide and 5 cm deep and consists of a pink enamel body and hinged lid decorated with a (sadly slightly damaged) image of Margaret Nicholson’s attack.